No… I'm not losing my mind! A couple of days ago, I posted on the blog about completely redefining how I offer products on the QuiltingBusiness.com site. In the 3rd and 4th paragraphs of that post, I basically explain that I'm going to be offering much smaller – and more affordable – products that are more targeted to your needs. 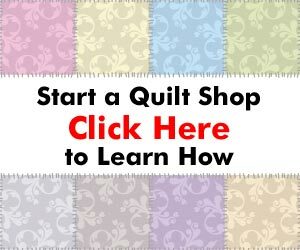 And, I'm going to be taking a lot of the bonuses that have only been available as part of the product packages and offering them at no charge to the Quilting Business Blog community. Well, it may seem like bad business to lower prices and give a lot of great material away for free, but it's something I've been thinking about for quite a while now. The Internet has been great for me, but the Internet environment has been changing for quite some time. As more and more web sites are added to the Internet, it becomes much more difficult to stand out in the crowd. So, instead of just trying to sell some basic products, I'm going in the direction of a lot of great information at no cost, and a few smaller products that are very affordable and very focused on what they will teach you. In order to put all this in place, I'm going to spend a few weeks re-working all my products, and figuring out the best way to get you some great tools. It could be higher, it could be lower (like a rollercoaster going up and down), but you can play with the refresh button until you get a price you like. It's great fun, and the savings will be incredible – it could be over 50%. I don't want to annoy the people who have no interest in any of the existing products, so I'm going to create a separate email list where I'll be answering questions and giving out some great info. So, I'll be creating a new email list that you'll need to register on before you begin getting the Rollercoaster pricing announcements. If you want to be notified first about the special Rollercoaster Pricing Sale, then you'll need to join the list. You'll be the very first to get the announcement that the site is live. That's it for now. Sorry the email is so long, but I'm very excited about the upcoming weeks and months. I really think you'll be getting some tremendous value from all the great info I'll be delivering at no cost, and you'll also appreciate the lower-cost products that will be available. P.S. A number of you have asked about my 7-week website building course. I'm still working on the outline, but I'll keep you posted as I get further along. P.P.S. I'm heading out to San Jose on a business trip this Sunday, so if you get emails at odd hours, it's because I'm trying to get all this done while traveling on business. But it was just too important to wait!